Facebook has become a valuable tool in determining the identity of someone who calls you, it should be a first resort to find out out who called you. 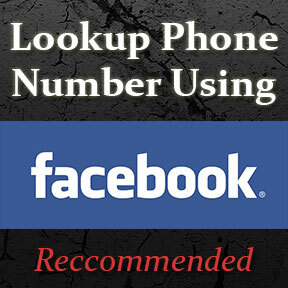 The first thing you want to do is write down the unknown callers cell phone number and go to Facebook.com. You WILL NEED a Facebook account to use this method, Facebook does not allow you to search without first having an account. You can create a Facebook account at www.facebook.com. After you have your account, go to the top of the page at the search bar. Type in the phone number in the search bar and press enter, if it comes up with a profile, congrats! You found out who the number belongs to! If the page displays a long list of search results, look through them and see if you can find out who the number belongs to from there. Otherwise, try another method listed on this site to reverse telephone search someone. Facebook has updated this method recently to also show search results through google. If you don’t see the phone number at the bottom of the search results using this method, try reading the Google Method to see if the phone number is available on Google.